So the November budget was a wash. Came in right on target; no extra savings beyond the automatic $300 savings. I only spent $744 on groceries (under budget), but spent $950 in the miscellaneous category (over the $800 budget), including $212 on car repairs. My son’s birthday party cost around $300, and that isn’t accounted for anywhere, so actually we didn’t save anything. I think that was the last big birthday party we’re going to have, because with three kids that is not a precedent that should be set. My only consolation with this budget outcome is that it could have been worse. And looking at the specific expenses, I see a few things I could have skipped, but not much. Some of the miscellaneous was for Christmas gifts, so technically that goes in the Christmas budget. We did spend a little more on babysitting than usual, what with some special events. Basically, I’m more convinced than ever that it’s the big expenses that need to come down, not the little ones — like the mortgage. But more on that in another post. For Christmas, I have drawn up two different budgets. One is what I would typically spend on Christmas. It includes all the “must-haves,” like a real Christmas tree, which usually runs us $60-$80, and activities like riding a replica of the Polar Express (never done before, but really wanted to try) and hosting Christmas Eve at my house. This totaled around $1500. Now, since I don’t really have a spare $1500 and I don’t want to go into savings, I wrote up an alternative budget. In which I let go some of my must-haves and must-do’s. Maybe we don’t buy a real tree this year. My mom said she would give me her fake tree, because she wants to get a smaller one. Maybe we don’t do Polar Express. Maybe (gasp) I don’t host Christmas Eve, or if I do, I do it realllly low-key. Maybe I don’t send out Christmas cards. Notice how cutting out these things also makes for a more relaxed holiday. Maybe instead of allowing myself to run up the credit card in the name of Christmas, I make it so that there’s no regrets in January. With this in mind, I went Christmas shopping Wednesday morning and decided to make Village Thrift my first stop. I’m so glad I did. Jackpot! And this pic doesn’t even show all the toys I got, because I already hid them in the attic. 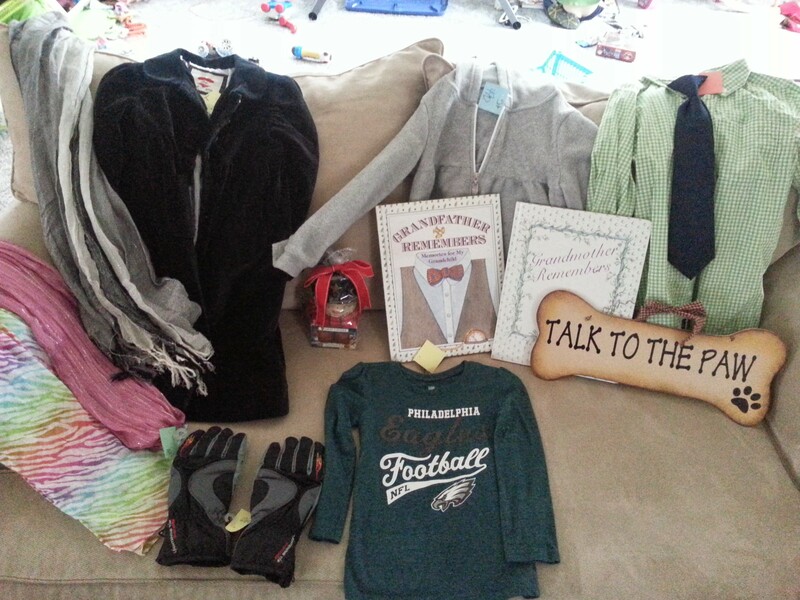 My haul included an unopened Yankee Candle gift set (good for teachers or hostesses), a black velvet Gap dress coat for my daughter, a dress shirt for my younger son for Easter (gotta think ahead), fun scarves for my best friend’s daughters, a hooded fleece for my daughter, gloves for my older son, a gift for my mother-in-law (a funny sign for her dog grooming shop), a La La Loopsy doll for my daughter and some other toys for her, Play Doh, a big set of stamps, jigsaw puzzles for my younger son because he is really into them lately, a Jenga-type of game for the whole family, and more that I don’t want to reveal. I also bought myself a new purse (I haven’t done that in 8 years), which was the most expensive item, at $20. Total? $83. It should have been $103, but the cashier helpfully pointed out that I could buy a $100 gift card for $80 (a promotion they were running), and use it right then. I can’t tell you how excited I was. And still am. Everything is in great condition. 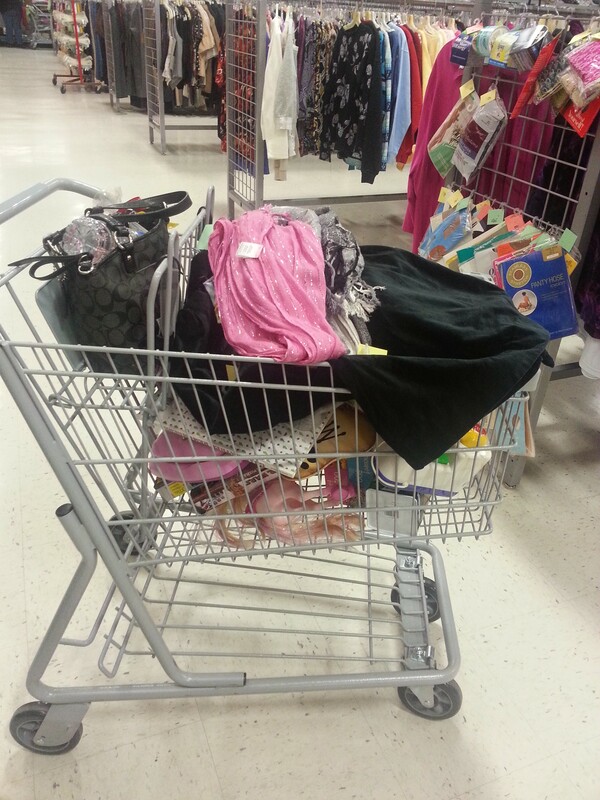 Then I continued down the road to Target, because my husband would divorce me if everything under the tree for the kids came from the thrift store. That is not his idea of Christmas. I picked up some Elsa stuff for my daughter, Legos for the younger guy, and a few other toys. I haven’t totaled everything up yet to see how it fits into the new budget, but I’m guessing I did pretty good, and I’m practically done. The rest of my gifting involves homemade stuff (I’ve been pinning like a fool on Pinterest) and maybe some gift certificates. Luckily, I don’t have all that many people to buy for. We also have a “Christmas Coin Drop” going on in our house, where everyone is supposed to put their spare change or any change they find on the ground, etc. Closer to Christmas, we will dump it out, count it out, and decide on a charity to give it to. A little lesson in math, geography, and generosity. This has captured my oldest son’s attention because he is very interested in natural disasters — right now, he thinks Haiti deserves the money. The house is all decorated on the inside, except for the tree; the outside lights are almost all up. Yesterday I cajoled/threatened/begged the kids into putting on Christmasy clothes and posing for a picture, which turned out really good. So I ordered a (limited) amount of Christmas cards on Shutterfly last night. (They were on sale.) This is the most ahead of the game I’ve ever been. I can’t believe it’s only December 5. Do you have any holiday traditions you’d be willing to get rid of to save money? Or is Christmas untouchable? We aren’t getting a tree this year since we won’t be her e- the first year I didn’t get one I cringed, but if you aren’t home for the big stuff and your miniature apartment can’t really accommodate it was easy to loose. I also shed the Christmas card tradition about 2 years ago but will likely bring it back in a limited way (I used to send 200+). I will do an eCard in some way no matter what though…For gifts we drew a name on each side of the family and only have to buy one gift. This is the first year we are bypassing gifts for the grown ups altogether and only buying for the kids. It helps keep the finances in check. Grandparents get a framed picture of the grandkid and I don’t buy anything super pricey by way of a frame. We were looking to save significantly by not flying up but my parents are coming here so we will be renting a room in St. Augustine and will have that expense. I think as Sara gets older it will get trickier. I do think we are going to go the route of one thing they want, one they need, one to read and one to wear. That’s great about not having to buy for grownups anymore! I don’t have too many grownups to buy for. Really, just grandparents. And Mr. McGuire. He is probably the hardest to buy for. With the kids, I’d like to do more “experience” type of gifts, eventually. This year young T. has only one thing he wants, but it’s around $300… and F. has somehow seen the “My Size” Elsa doll and keeps saying she wants that. And that is like this year’s Tickle Me Elmo… impossible to find now. Lol. Might be some sad faces this year.